Is there a way to select a series of Chat Posts and turn it into a Proper Discourse post? Say a conversation got started in Chat that eventually became something “postable” Could the admin / moderator have the ability toi select the related questions / replies and turn it into a post? What determines who shows up on this list? Most of these folks I’ve never spoken to before. Nor do they actively participate in the forum for the most part. I’ve had both these same thoughts/questions myself. When logged in as a non-admin user, clicking the Bullhorn icon to expand the chat doesn’t do anything. I’ve disabled Babble temporarily as my members aren’t able to use it. I see the following errors in the browser console for a single click. Has anybody else ran into this? Thanks. The permissions as far as I can tell had valid settings, but I deleted some of the newer chats I added and things are working again. I found my root issue; I had a chat that was paired to an existing private category. However, the only group that had access to that category had since been deleted by an automated process. This wasn’t obvious in the /admin/chats settings as the chat->category pairing is still valid. Thanks so much for the support and the great plugin you’ve written here. 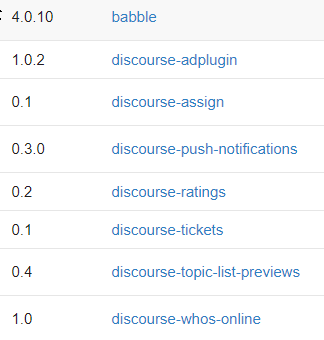 I’ve used many forum platforms in the past and when it comes to chat add ons, Babble is by far the best. Donation sent and I hope others will join in. Does anyone notice problem with own messages under other user? On my discourse when many people talking, it happens sometimes. My messages is under someone else but only on my device, after refresh (F5) bug disappears (good message order appers). It’s not only my problem, other users have the same issues with their messages. Making the setting to show Babble as open by default to user settings makes a lot of sense, but I wonder if we could get a global setting for a default. I mean, so that the new users would see the chat opened unless they specifically disable it? Does the plugin have a route name? I want to launch it form the Discourse Tab Bar theme component, and it works with URLs or route names. upon clicking the link in the theme component. I have installed babble, and it says it’s installed and enabled, but I do not see the interactive icon even if I set to right/left or play with settings? I have tried on stock and other themes and doesn’t seem to make it work. Any ideas? Anything I can provide to help figure this out? I don’t know, maybe it was a cache thing. No matter how many times I retried it didn’t work. Rebuilt the thing, and now it’s showing. Thanks for the work, nothing to see here. Also @jrgong I would like to have that option on the mobile bar element as well. Please let me know if you manage to do it! Speaking of interactions with the mobile bar element! Also I seem to not understand the chat history function? The history is still there and editing this setting doesn’t appear to change any chat history display? Is it possible to request the feature of changing chat channel avatar/icon pictures? Currently, they just make a circle of whatever the category/subcategory color is. I’d like a picture. So my chat for “Apple” can be an Apple. Orange can be an orange, etc. Latest Discourse and plugin version. Currently, there is only one channel. Options are by default. I confirm. It’s now working, thanks! Making the setting to show Babble as open by default to user settings makes a lot of sense, but I wonder if we could get a global setting for a default . I mean, so that the new users would see the chat opened unless they specifically disable it? You could store another custom field somewhere else, like SettingsCustomField if it exists, with the date last run, then use that date against users created date. That way you’d keep any old settings that the users had. If there is a webhook for new users being created, you could install GitHub - adnanh/webhook: webhook is a lightweight incoming webhook server to run shell commands and create a webhook on new user to trigger a custom shell which could run the routine for you.